Vacancies - September 2008 for 2 ½ to 5 years old. Wesham Playgroup and Pre-school is a not-for-profit community group registered with the LEA and Ofsted as a Provider of Early Years Education. Fire struck a family home on Weeton Road on Wednesday afternoon leaving a bungalow severely damaged. 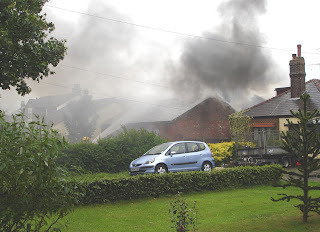 The road was closed for several hours until the Fire Service were satisfied the fire was completely out. As advertised in the Kirkham and Wesham Advertiser, the free draw for the Wesham Parish Plan Questionnaire was held on Saturday, 14th June 2008 at the Club Day Field event. The winning tickets were drawn by the Wesham C.E. Rose Queen, Holly Taylor, witnessed by the Vicar, Rev Paul Bennett. Our thanks to all who completed the questionnaire and our congratulations to the winners! Change Your World in 50 Words! Swap just one car trip between 30 June – 5 July and Change Your World. Walk, cycle, use public transport or stay home instead, but join in and help us reduce car traffic by 10%. Take your first step now at http://www.changeyourworld.org.uk/ and for a chance to win great family prizes. Imagine a world with cleaner air, quieter streets and more space for kids (and big kids) to play. It’s easier to achieve than you think. Amazingly, if we all drove just one less journey a week we’d reduce car traffic by 10%. Fancy giving it a go? Swap any car trip between 30 June-5 July and walk, cycle or use public transport instead, or don’t make the trip at all. Take your first step now at http://www.changeyourworld.org.uk/ and for your chance to win a Center Parcs family break and other great prizes. 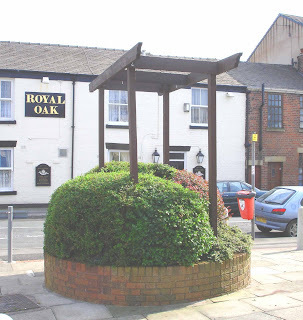 for their work in repainting the Pergola and pruning of the shrubs. New hooks have been fitted in readiness for the 6 hanging baskets scheduled to be installed in the next day or so. This is another good example of the work of the Probation Service for which we are most grateful.